A Minty Xmas and a Malbec New Year! This turned out to be very tasty and an excellent choice. I hope you’ll try it. You may not being able to buy wine today but there’s always Boxing Day! As you may recall, we have tusseled with mint candy in the past. The pervious success worked with a port, since it is so heavy and fruity. The rich heavy flavor washes away the mint. Otherwise, the mint will dominate the wine’s flavor. It is just yucky. But I didn’t want to repeat my success(especially because I can’t afford Port at the moment), so I chose the other heavy wine I adore: Malbec. My favorite type of Malbec is rich and juicy. I liken it to eating a delicious chocolate cake. Occasionally you get a weaker one and that would not work with a mint pairing. I tried my luck on this bottle. I had tried the other Malbec’s in the store (surprise surprise), so I moved on to something new. It turned out to be a pleasant surprise. The wine is perfect-it is smooth and rich with hints of blackberry. There is a slight sweetness that fills the mouth. It dominates the senses, which is a good sign for our pairing. It reminds me very much of the El Presidente that succeeded in the last mint pairing. The candy cane Hershey’s Kiss is not especially strong. It’s minty, but mostly sweet. With a sip of wine, the peppermint remains but wine holds its ground. I credit this to the white chocolate which balances the intensity of the peppermint. Even the bits of candy cane sprinkled in the kiss feel faint when surrounded by this white gold. The mint hershey kiss is more of a challenge since its entire center is bright green with mint. The Malbec and the mint mix nicely, with the wine maintaining its flavor. The mint remains strong, but since the wine is so heavy and rich it isn’t dominated. They flavors melt into each other. The Take Away: Both Port and a rich Malbec pair well with mint! See, we are learning! Posted in Malbec and tagged Candy, Christmas, Hershey's Kisses, Malbec, Wine. Bookmark the permalink. I have been on a chocolate kick lately and I am sorry but it’s staying that way for awhile. You can call it whatever you want and in regards to jokes about women and chocolate, let’s just say there is no amount of wine to make them funny. And I’m realizing that chocolate is not always that easy to pair. Chocolate has so many varieties and textures. It can be coated in candy, encased between graham crackers and put on top of ice cream. And although red wine and chocolate is a safe bet, it is not always going to be a slam dunk. I am sorry chocolate, for thinking you were so easy to understand. Can we start over? Before I begin, I have to do a shout-out to my friend who gave me some chocolate to pair. Not only is it delicious chocolate, it is coffee chocolate. It was super nice of her and I encourage everyone to..uh..do that. Anyway, I also had left over Xmas M&Ms from making my gingerbread house. This splash of Christmas cheer is a bit of a warm up for next week’s pairing. Mmmm shiraz. A delectable fruity wine I don’t know too much about. I always associated it with being light, but that is because the name flies off the tongue. It sounds like a dance step. At any rate, I thought the distinct fruit flavors would liven up the coffee and chocolate.I knew the Mexicano chocolate had a subtle coffee flavor, so I worried the fruity shiraz would throw off the coffee flavor. I tossed in the M&Ms at a whim, because they were simply on hand. I know you guys can see my reflection in these photos. I can’t pretend otherwise. Let’s see how it went. The first prominent taste in the Shiraz is the pleasant and familiar bitterness. It reminds me of the skin of an orange. The bitter flavor transitions into a bursting of rich pomegranate. It pops on your tongue. The chocolate is flaky and dark with a slight crunch. It is rich and coats the mouth. The aftertaste is definitely coffee. After I take the sip of wine, the chocolate fairs pretty well and the bitterness decreases. It is still there, but faint instead of commanding the taste buds. The coffee flavor in the chocolate is weaker too. The pomegranate and chocolate flavors meld nicely, but it wasn’t quite the effect I wanted. The M&Ms taste extremely sweet in comparison to the dark chocolate. The wine gets increasingly bitter with the M&Ms staying true to their very very sweet form. It is actually ok, but not amazing. This pairing went well all things considered. The flavors were interesting and a little unpredictable. A coffee chocolate may be more suited with a port, but I could be wrong. The Takeaway: I recommend a fruity wine with a darker chocolate, though you may not get all the initial flavors. And as promised, my gingerbread house! Posted in Shirazy and tagged Candy, chocolate, Shiraz, Wine. Bookmark the permalink. I swear I am going to blog. Just leave me alone for now. I’m back! It took long enough due to holidays, illness and busy work. This is why guest posts are very valuable, ahem. But finally I have a post to offer my dearly dedicated readers. As I mentioned in my last post, I planned on pairing a Chardonnay with Reese’s Peanut Butter cups. That pairing pretty much happened, although I opted for a white blend instead of a Chardonnay. Not sure that was the best decision, but here we are anyway. The Wine: Goats Do Roam, South African. There is also a lot of the peanut butter filling [in Reese’s] and it is very sugary. I would like to try them with a dry chardonnay which can compliment the sweet chocolate and peanut butter. Of course I decided to go against this advice and chose a blend. In my defense, Goats do Roam was on sale and is a decent white. Money is always tight around the holidays so I went the economical route. Not really the best choice, so now I am determined to try this pairing AGAIN. I do think a white wine is how to go when pairing Reese’s with wine, so I made it halfway. The blend is pleasant and sweet with a charming tang. It ends smoothly. But to my dismay, after a bite of Reese’s the wine loses its flavor completely. In the the battle for my tastebuds, the Reese’s won. It’s sugary sweetness overpowered the white. Goats Do Roam is a lovely table wine, but a pairing wine it is not. It tasted like a very week grape juice. I’ll admit, I was rather devastated. My boyfriend and I didn’t even comment on it because what is there to say? It is my own fault because I should have gone with my instincts. I have another pair lined up and sitting in my apartment! The wait won’t be so long this time….til then! p.s. Check out this winery that does Halloween pairings every year…including Reese’s! I won’t read it because that’s cheating but..my hats off to you. Posted in White Wine. Bookmark the permalink. Alas I don’t have a post yet. I was struck with illness but I hope you are busy too and not noticing my deficiency. Stay with me! I have something in the works. 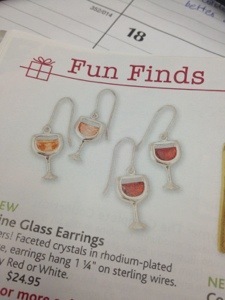 For now enjoy these cute earrings.